While looking through a book I happened upon a painting by Lorenzo Lotto in which a grieving widower gestures to his liver, which was thought at the time to be the source of melancholy. Something about the man's posture and expression put me in mind of one of my favorite performers — Laloo. 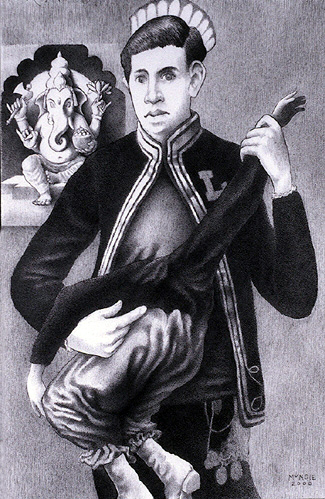 Laloo was a native of India, and happened to have a headless parasitic twin attached near his sternum at its neck. For the sake of publicity, the twin was referred to and dressed as a female, thereby claiming brother and sister united in one body. In photographs, one often sees Laloo holding his twin's arms outstretched as Laloo fixes his gaze upon the camera. His expression is difficult to interpret: somewhat sad yet resigned. Since Laloo was a Hindu (or is said to have been in some sources), I decided to change the Christian iconography of the original painting. Whereas Lotto's painting included in the background a sculpture of a winged putto standing upon and upholding a set of scales (alluding to the divinely sanctioned love the subject shared with his departed wife), my drawing features the elephant-headed Ganeesha, the god of infinite compassion and remover of obstacles.